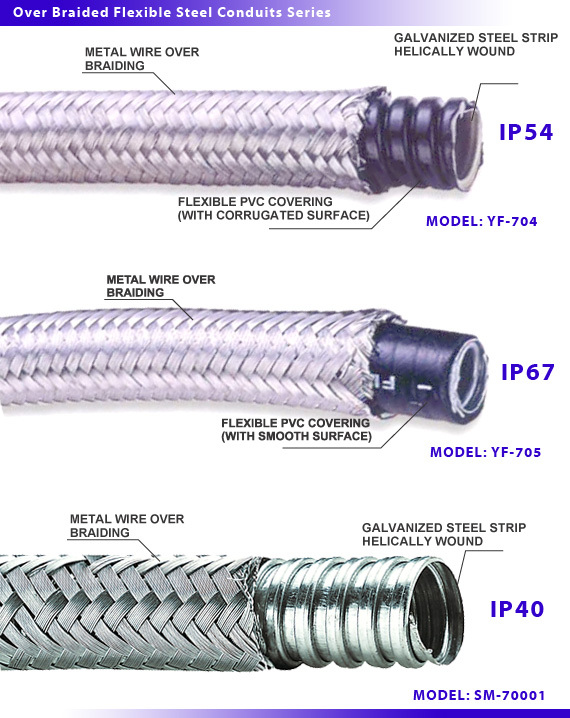 Overbraided metallic LiquidTight conduit with stainless steel braid is suitable for industry environments wirings protections. This conduit is designed to protect sensitive electronic circuits in applications such as communications, radar and data transmission from Electro-Magnetic and Radio Frequency Interference (EMI / RFI). Most suitable for radar equipments, airports, CNC machineries and PLC wirings in industrial environments. *Wire over-braiding provides more abrasion resistant, EMI shielding and resistance to hot metal splashes. *Inner core made from galvanized steel strip. *Square locked construction with packing for more tensile strength or air tightness. *Other packing materials: copper bonding (grounding) wire, PVC wire packing is also available.